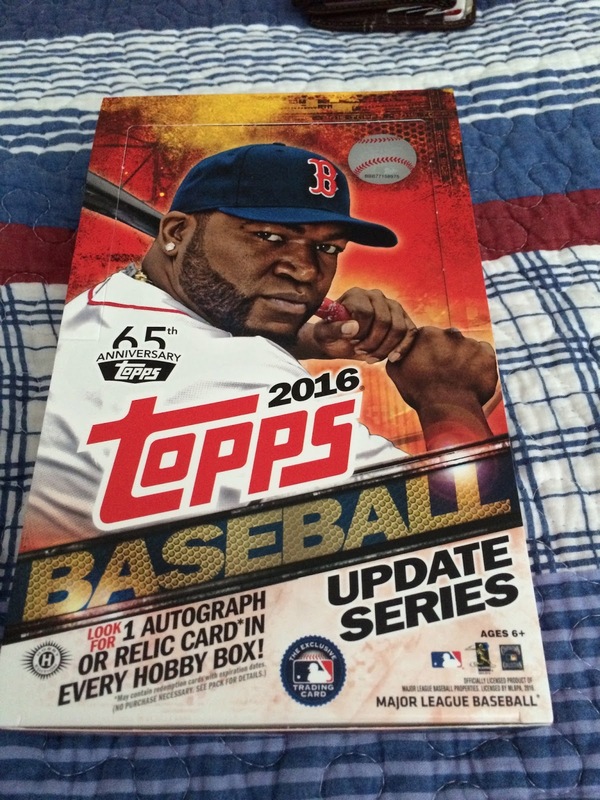 The first product I ever bought a blaster of had David Ortiz on the cover. 2007 Topps Series 2. 20 packs to a box. Every box came with a Ted Williams insert- me looking at the box, at age 11, thought Ted Williams looked different from that. It's fitting that 9 years later, on the eve of my 10th anniversary of collecting, we get another Ortiz box, his last year in the bigs. And it happens to be 2016 Update, a cherry on top of one of the most disappointing years of flagship in recent memory. Still, there's enough in here, such as a guaranteed auto/relic and lots and lots of cards of traded players, to be savored, especially by me. So we're gonna dive in. 36 packs, 10 cards per pack. Shouldn't be too bad. The base design hasn't improved by much- the smoke clouds are still a problem, as is the zooming and bland-filtering on literally every photo, Bunt-readying every one. 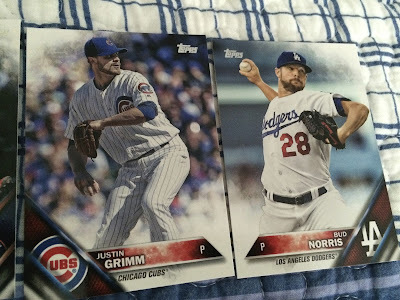 But...it's nice to see fringe players like Bud Norris and Justin Grimm here. Ezequiel Carrera is a fringe guy who made some big moves in the postseason, so it's great to see him here. Still, the Ichiro checklist is still a highlight- wish they would have just said '3,000th'. All-Stars abound. Goldschmidt, and the dearly departed Fernandez. This Miguel Cabrera is a BLACK PARALLEL, #'d to 65. 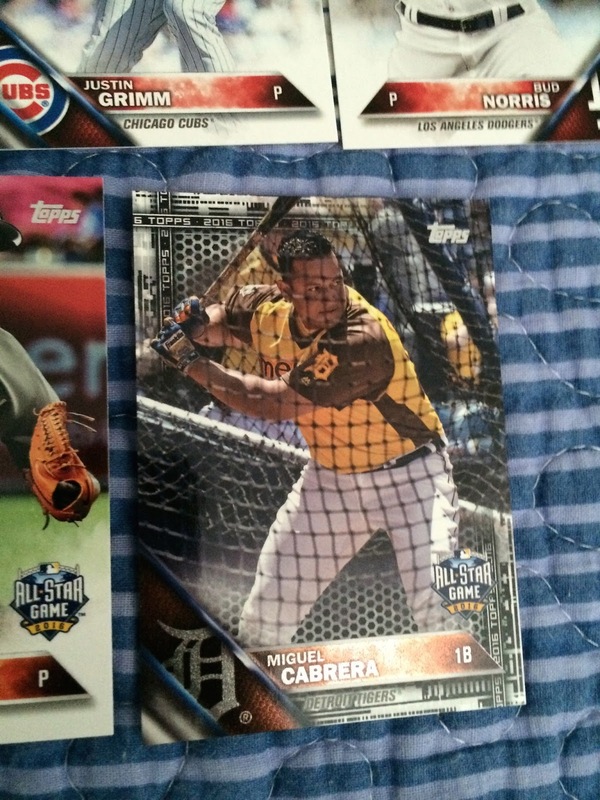 It's absolutely insane that I'd pull that in Pack 1, and that it'd be someone as absolutely amazing as Miguel Cabrera. Props to Topps for giving me a good one. A trio of fringe players- Alexei Ramirez was a shell of his former self in San Diego, Jose Lobaton will likely be the starting catcher in Washington next year, and Jeremy Hazelbaker had a HUGE start...and that's about it. Two cool combos- Andrew McCutchen and Josh Harrison hanging in the dugout, and Nomar Mazara and Prince Fielder elbowing it out. At least Topps is bringing back player-cameos and more fun photos. Snell had a nice enough rookie year. Nolan Arenado and Corey Seager had even better 2016s. The Aaron Sanchez card is just pitiful- the reporter's not interested, Sanchez isn't really into it, and most of the card is settled on Brad Brach's Back. At least the Andrew Miller card, #'d to 2016, is a pretty nice display of the awesome Yankee reliever...before he became a postseason beast with Cleveland. Willson Contreras had a pretty potent rookie season, while Wade Miley tried his best with two tough rotations. Two more cool fringe players, Derek Dietrich and Matt Andriese, followed by the long-awaited 'Todd Frazier is a White Sox' card. Our hit, gotten out of the way here in Pack 3, is a sticker auto...but it's Michael Fulmer, a guy that may very well be the Rookie of the Year this year, so it could be YARDS worse. Actually, knowing the usual auto-fodder in update, this is pretty impressive. 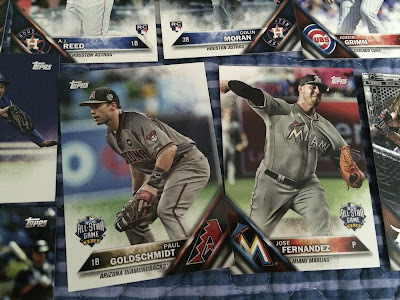 Taylor Motter's our GOLD PARALLEL. Meanwhile, Sean Manaea, a member of the surprisingly potent Oakland youth movement, has a nice enough rookie card. 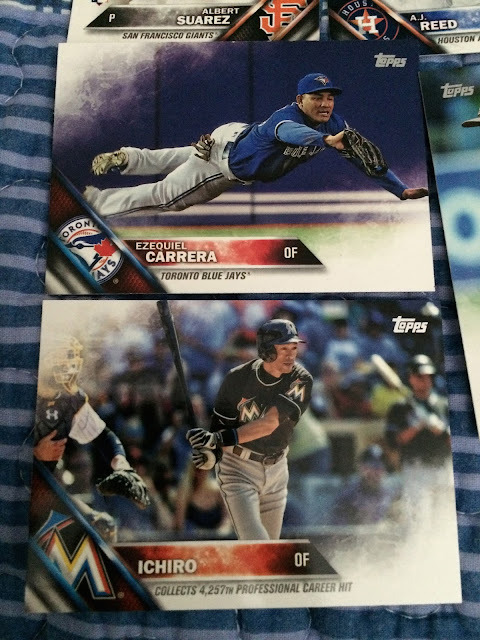 Two ASG cards- Ramos' is obviously the more populated one, but Teheran's is still cool. Matt Moore was traded by the deadline and managed to be a nice addition to the still-powerful San Francisco rotation. Jose Berrios...tried his best. Jake Arrieta and Trevor Story, two newsmakers of 2016. This, I believe, counts as Story's rookie card, which will be worth something if the rest of his career amounts to as much as his first three months. ALL STARS! Adam Duvall is basically Adam Dunn 2.0. Steven Wright has yet to tell one-liners. Trayce Thompson, plus Ian Desmond's maiden card as a Ranger (well done, Ian! ), and a card of John Jaso's well-batted season in Pittsburgh. Two very nice horizontal cards- Pedro Alvarez is flanked by his teammates for his surprisingly okay 2016 season, while Neil Walker rounds the bases in Queens. 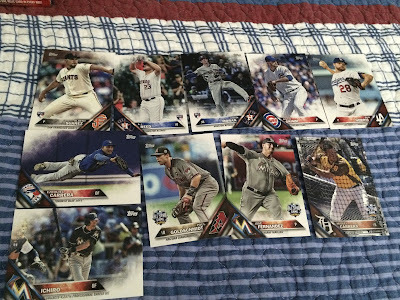 Our insert is a 3000 Hits Club insert of Willie Mays...which just doesn't look great. Tim Anderson's rookie and ASG cards of NL West standouts- Posey's is a pretty nice one actually. Brad Brach, middle-relief superstar, plus 3000 Hits card of Al Kaline. A trio of potent pitchers- Colon, in an ASG-worthy season, Vince Velasquez, damn near saving my Phillies, and Cole Hamels absolutely dominating. And some dudes who were traded- Melvin got some nice playoff hits, as did Jonathan Lucroy, while Eduardo Nunez was a bit quieter than the Giants would have liked. Betances and Cessa were some of the reasons why the Yankees weren't an ABSOLUTE failure this season. Two solid Rookie Debuts- Diaz' features lots of head touching, while Schwarber's features a very aggressive umpire. "out of the way, woulja? I'm trying to watch the game!" This is a very busy insert design, and...it SORT OF works, I think. A lot of it works, and some of it doesn't. Still, it's a nice change of pace from the usual blandness in inserts. Part 2 will come quite soon, though maybe not tomorrow, as there's apparently a World Series game then. It looked dire initially, after an opening smash by Jose Ramirez, but the Cubs, if anything, persevere. 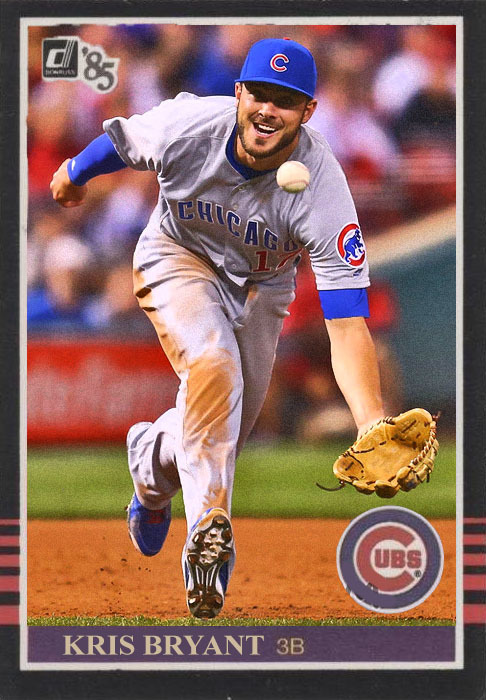 And, thanks to some nice work from Kris Bryant and Aroldis Chapman, in some of the longest relief work of his career, the Cubs made it through Game 5, and have managed to stay alive through the three-game excursion to Chicago. Right...now the Series shifts back to Cleveland, where...where all hell is about to break loose, I reckon. I'm pleasantly surprised that the Cubs were able to fight back tonight, as I was fearing the worst after Game 4. This is coming down to pitching, and right now the Indians are winning with Corey Kluber and Josh Tomlin...and just taking the losses whenever Trevor Bauer's starting. The thought would be for Kluber to start Game 7, if needed, to shut down the Cubs, but Kluber's been on short rest all series, and eventually that's got to catch up to him. Still, the Indians will be heading home in Series-winning position...which are words I didn't think I'd be typing on this blog. So...either way, a fun team wins, but part of me wants to see a Game 7. Tuesday's the next game, and we'll have to hope for a mighty good one nonetheless. A month or so back I nabbed three Stadium Club boxes: 2 1995 products, and one 1996, for the purposes of knocking off my 'every Stadium Club ever' goal, which will likely never be fulfilled. Still, these boxes were hella fun to rip, and this last part of '96 SC is still a pretty nice ride. A trio of great 80's pitchers- Benes, Aguilera, Reynolds. Followed by a trio of Steroid Abusers- McGwire, Clemens, Bonds. Clemens is the Silver sweepstakes insert. Well, luckily I got the base version of the Clemens, so I can tuck it in the base collection and not have to look at it again, along with this late-career card of Deion Sanders. My one successful base pull was a card of Hideo Nomo, still a cool guy to collect, even if he's not necessarily a Hall of Famer. The one-per-pack Team TSC insert here was Reggie Sanders, which...works, I guess. As an appetizer, here's a card of Jay Bell running the hell out of Pittsburgh and getting himself on a flight to Kansas City. Brian McRae, who must have been in a billion sets in 1995-96, sits here as a cool-as-a-cucumber member of the Cubs, next to a still-dangerous Team TSC of Chili Davis. Not much to call home about in Pack 20, but here's Ozzie Guillen making a sweet double play, and Sid Fernandez surprisingly suiting up for the Philadelphia Phillies. A trio of very 1996 faces- Johnny Damon was coming off a stellar rookie season, Eric Karros was still a threat for LA, and Heathcliff Slocumb was somehow a hugely threatening closer. That is another really cool stadium shot of Paul Sorrento, as well as a sweet running Team TSC shot of Craig Biggio. Yeah, I know I shouldn't post a card of Moises Alou right near when the Cubs may be in jeopardy, but Moises was on the side of good, and he was one of the main reasons why the Cubbies had a chance in '03. Also, Jeff Montgomery was still a leading closer back in '96. Ricky Bottalico was a pretty nice closer for the Phils back in the day. Got his autograph a few years back at the Philly Show. Also, Garret Anderson was just starting out around here. Interesting...in this portion, I've pulled a Team TSC of a guy named Bernie, and a guy named Sanders...very interesting indeed. Also, Bernie Williams is always a welcome pull for me. The box ends with a whimper- Mark Gubicza, Shawn Green and Team TSC of Robin Ventura were my highlights. Woo-hoo. 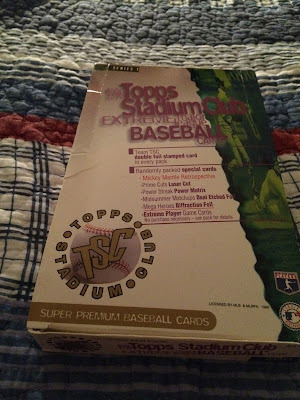 That was 1996 Stadium Club, and no, I didn't yield the whole base set, so I'll work on want lists. In a few days...another box break will be up. It won't be Nostalgic. A Mid-Series Meditation: Is This What We Wanted?